Did you know candy canes were originally created in order to keep children quiet in church? According to the folklore story, the choirmaster at the Cologne Cathedral in Germany wanted to keep children quiet during a long performance at the Christmas Eve mass. He asked a local candy maker to make the sugar sticks and had them bent in the shape of a Shepard’s staff in honor of the Shepard’s that visited Jesus. Whether or not you believe the story, I think we can all agree that candy canes and Christmas are synonymous. I know I love the taste of anything peppermint this time of year, especially when you couple it with some chocolate. When I decided I wanted to make a dessert inspired by the candy cane I passed on cookies, cake and brownies. I went for cheesecake because it’s one of my favorites. With its creamy texture and the variety of different tastes you can create, there’s no denying cheesecake is one of my favorite desserts. Coupled with the cool, winter taste of peppermint and you have a dessert that will certainly keep little children quiet while they gobble it all up. I made my recipe in a pressure cooker but feel free to use the base recipe and cook the cheesecake any way you want. Check out the full recipe below! Crush your graham crackers. Make sure they are crushed to a very fine consistency and then add your melted butter. Press the mixture into the spring form pan and then put the crust in the freezer for 10 minutes. Combine your sour cream, heavy cream and cream cheese. Mix well. Add your sugar, flour and eggs and mix well. Make sure not to over mix though or you will get air bubbles in the cake, which doesn’t make much of a different in taste. It’s more of a look thing. Add vanilla and fold it into the mixture. Add your peppermint extract and food coloring and fold it into the mixture. Remove the pan from the freezer and use butter or olive oil to coat the edge. Pour the cheesecake filling into the pan and even it out with a spatula. Add one cup of water to your pressure cooker. Tent your cheesecake with tin foil. Use the stainless steel rack that comes with the pressure cooker and lower the cheesecake into the pot. Secure the lid and cook on high pressure for 33 minutes. Remember, you will need to allow time for the pot to come to pressure. When the timer is done, let the pot vent naturally for about 10-15 minutes. Then, release any final pressure. Take the tin foil off and let the cheesecake cool on the counter for about an hour. The, put the cheesecake in the refrigerator for at least three hours. Once it has had time in the fridge melt your white chocolate chips in the microwave. About 30 seconds should work. Crush your candy canes while it melts. Use a spoon to put the chocolate on top of the cake and then sprinkle the candy cane on top. Happy eating, friends. For more recipes, click here. For more holiday recipes, click here. You had me at cheesecake! And adding candy canes to it? AMAZING! I would love to make this! I had never heard that story. So cute. This cake looks delicious! And the recipe seems pretty simple. Thanks for sharing. OH wow! This one’s a keeper! Yum! Oh this looks so good! 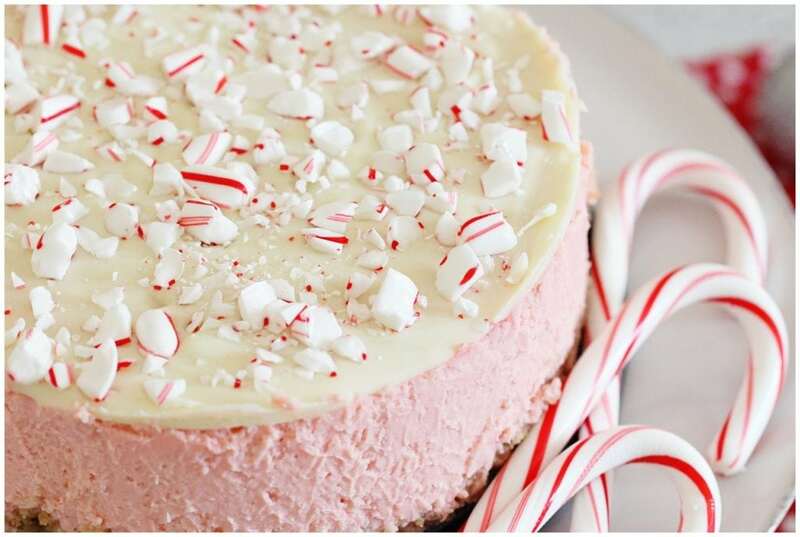 I’ve never had candy cane cheesecake before and I can’t believe I never thought about making it! I really appreciate the recipe! I love anything with white chocolate and the peppermint on top makes it so festive. I would make this for any holiday party. Wait, what? You make your recipe in a pressure cooker? Brilliant! Happy Holidays… I’m going to dust off my pressure cooker and try this! Super interesting that you made your cheesecake in a pressure cooker. That is not something I would have thought would work for desserts. I don’t know if I believe the story but it’s definitely an interesting take on it! Oh my goodness!! 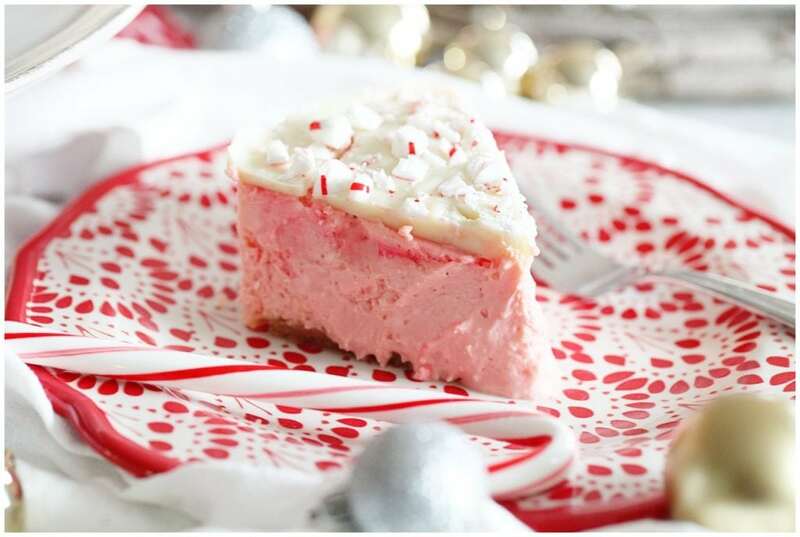 I almost wish I hadn’t read this because now I feel totally obligated not only to make it but EAT most of it…two of my all-time favorite desserts, cheesecake and candy canes! LOVE it!! Peppermint flavored desserts are so much fun at Christmas!!!! Thanks for sharing definitely going to give this a try. So festive and so pretty! I love peppermint this time of year, I’ll have to try this! I’ve never heard that story, adorable. And that cheesecake looks so festive and delish! Pinning it! I am a total sucker for a good cheesecake! I love making it, love eating it, and add peppermint into the mix, YES PLEASE! I know my nephew would love this cheesecake. He is a huge fan of peppermint. Great recipe I can’t wait to try. this looks almost too pretty to eat! what a great dessert to top off a holiday meal. I love the story about the candy cane origin. I hope it’s true because it’s a great story. The candy can cake looks phenomenal. I don’t think I’ve ever had a cake that included candy canes in the recipe. But I imagine I would LOVE it! My dad and I have a fun tradition of making a homemade cheesecake once a year. Usually we stick to a classic recipe but this would be such a fun way to mix things up next time! OMG this looks so heavenly! I need to step up my baking game and try this out! This cheese cake is beyond! It looks so yummy and festive! I may attempt to make this! This just looks delicious. I mean I love all things cheesecake and this one is perfect for the season. I will have to save it and try it. It’s so beautiful, I’d just want to admire it on my table. The peppermint reminds me of my grandmother. I’d love to share this receipe with my kids. This looks very delicious! Great recipe for the holiday season. The cheesecake looks heavenly. I know I sound like a broken record, but I just love all the candy cane or peppermint treats during the holiday season. Candy Canes and Cheesecakes??? You sut brought two of my favorite things together on one dish! This sounds amazing! Ohhhh emmm geeee! This sounds fantastic! Even though it’s after the holidays (technically, now) I’m still going to make this! Pinning for later! What a beautiful cake! My daughters would love this and I’m sure it would be a great conversation starter this week! This looks (and sounds) delicious! I love that you added in the story behind the candy cane as well. What a neat little history lesson to share with kids when enjoying this dessert! Oh wow! This is one of those sweets I could see myself making all year long! This looks so yummy! Can’t wait to try! Omg, this looks delicious!! I’m not the best baker in the world, but I just might give this recipe a try. This sounds and looks SO good! I am definitely going to try to make this. Oh my gosh! Two of my favorite ingredients in one spot! I can’t wait to make this! I have a real soft spot for cheesecake and this sounds like such a festive edition. I definitely need to give it a whirl. That is the best cheesecake recipe ever! I love peppermint all year long, but around the holidays, it seems to taste even better. A cheesecake that tastes like Christmas! I have to try to make this recipe and I really hope that the result will be as good (and good) as yours! A cheesecake that tastes like Christmas! I have to try to make this recipe and I really hope that the result will be as good (and good) as yours! So yummy! A cheesecake that tastes like Christmas! I have to try to make this recipe and I really hope that the result will be as good (and good) as yours! So yummy! So good idea! Stop the presses! 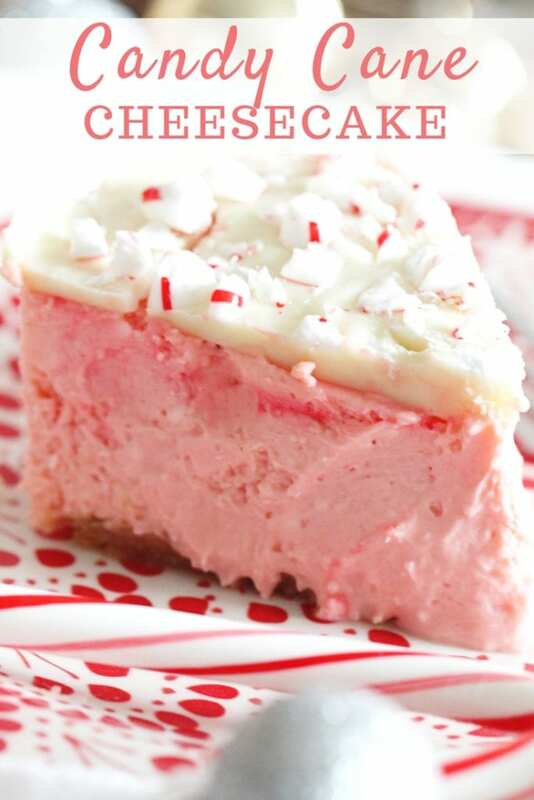 Candy Cane Cheesecake????? This has to be made for Christmas this year! First of all, the choose cake looks great and pleasing to the eye! what camera do you use? My mum introduced the family to cheese cakes two years ago and since then I am always in the mood to have a cheese cake because I have a bad sweet tooth anyway hahah Thank you for sharing. I LOVE this so much! I can’t wait to make this over the weekend! Oh wow, so festive and gorgeous!! I love candy cane anything so I need to make it. Cheesecake is one of my favorite desserts. This sounds like the perfect holiday cheesecake. This recipe is so pretty!! I love how the pink and white complements one another. I bet it is tasty too! A part of me graving for sweets is telling me to bake this, the other part is murmuring some sugar-level warning. Oh well, let’s see which wins. Looks yummylicious! Who knew? Cheesecake in a pressure cooker?!? It looks delicious. It looks sooo good! The cheesecake looks so pretty and delish! Can’t wait to try it! This is such an amazing holiday dessert! Looks really good! What a really amazing holiday dessert! Well this is so pretty!!! My family is such a fan of peppermint flavors, we’ll have to try this! This is so my kind of cheesecake! Not only does it look delicious but it’s beautiful! I need to try this one. What a festive dessert! 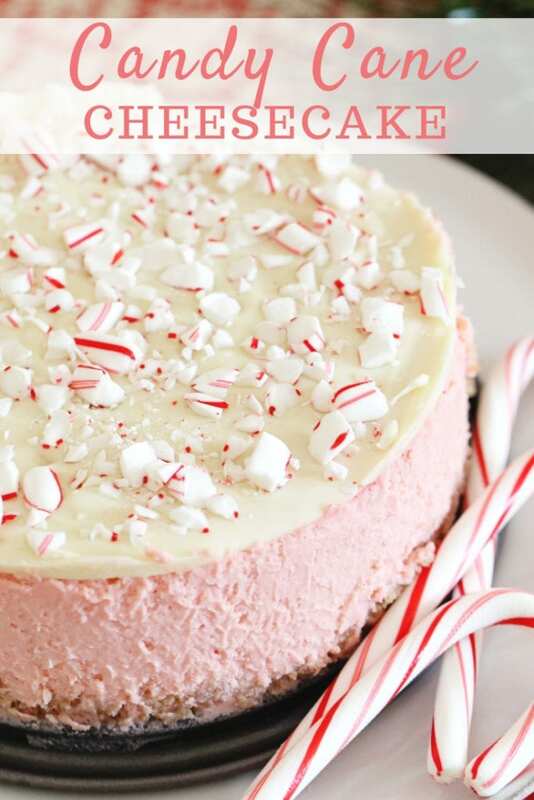 My whole family will love this candy cane cheesecake! Yummy! This looks wonderful! My father in law makes excellent desserts for family dinners and I’d love to bring this over for a surprise from my own kitchen! I love peppermint, and this looks delicious. Definitely perfect for the holidays! I’ll have to make this for when our guests come over. It’s so pretty and festive! This is such a beautiful and festive dessert! I bet it tastes just as good as it looks! Wow this is really beautiful. I have to try my hand at it and see if it comes out half as beautiful as yours. Thanks for sharing! This is such a perfect sweet treat on Christmas looks so delicious! Thanks for sharing this recipe, now I know what to add on my list this coming holiday. THis looks divine! I may make this over the holiday break. I’m sure the boys would love it! Two of my favorite things! Definitely pinning this! We love cheesecake! And I love the idea of adding candy cane. It makes it look so festive. Thank you for the recipe. What a festive holiday dessert. 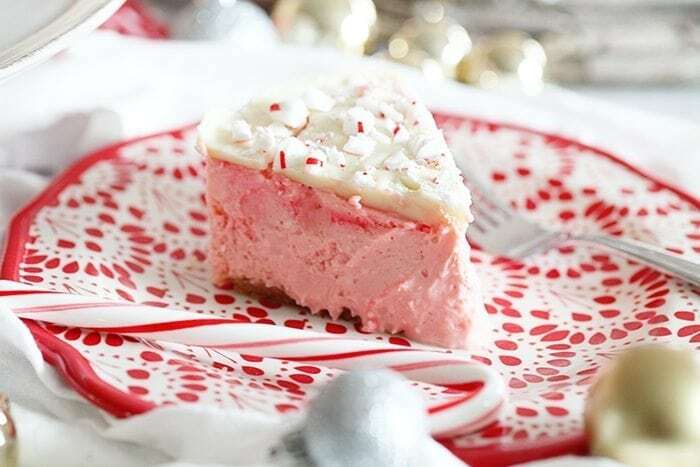 This looks like a nice way to enjoy peppermint looks delish! That makes my heart merry too. Pinning it to make for Christmas party dessert (I volunteered to bring a dessert for the work party). This looks like it would taste amazing! Not to mention it is so festive and pretty! Oh my word, this looks amazing. I am having cheesecake with Christmas dinner, I’ll have to try this one. Thanks for the recipe! First off, WOW! This looks insanely amazing! Secondly, I have never made cheesecake at home, but I think this might be the perfect reason to try!